Western Sahara is a disputed region in North Africa and is not a recognized country. About 80% of the territory is controlled by Morocco and 20% makes up the Sahrawi Arab Democratic Republic. There is a sand wall that separates the two regions. From what I’ve gathered, after the Spanish gave up control of this entire territory in 1975, Morocco and Mauritania shared control, with the native Sahrawi people lacking the power needed to take over their claimed homeland. Eventually, amidst fighting, Mauritania moved out of the region and Morocco reinforced its presence. Western Sahara has been a disputed territory ever since, with most of the Sahrawi people living in and operating from refugee camps in Western Algeria. 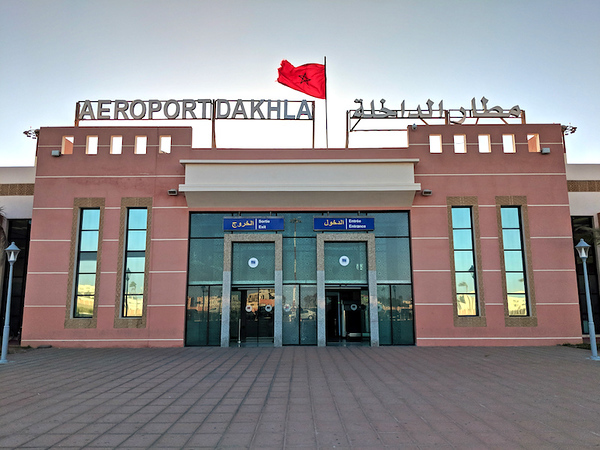 Dakhla is under Moroccan control, with Moroccan military checkpoints throughout the area and Moroccan government buildings and flags clearly displaying their presence. However, Morocco’s sovereignty over the territory has yet to be recognized by the international community. Some people consider the entire region to be Western Sahara, while others (such as the Moroccan government) consider the Moroccan controlled portion to be Morocco or Moroccan Sahara and only the area under the control of the Sahrawi Republic to be Western Sahara. Like many places, the history and current situation is complicated. Most people arrive via flight from either Casablanca or Agadir or overland from Morocco or Mauritania. Entry requirements are the same as Morocco given its control over Dakhla and 80% of Western Sahara. As a result, you do not need a visa if you have a passport from the UK, EU, USA, Canada, Australia or New Zealand and you can stay in the region for 90 days. Other nationalities should check for the latest information as you might need to apply in advance for a visa. The very small airport is actually in the center of town. It’s about a 3 minute drive to any hotel. When you arrive you will go through a quick immigration check and then be on your way. Taxis and drivers are waiting outside the one exit and are easy to find. Overall, arriving and departing at the airport is very simple as there are only a couple of flights per day, either to Casablanca, Agadir or Las Palmas, Gran Canaria. You can also arrive via land from the north (Morocco) or the south (Mauritania). I did not cross the land borders but from what I’ve heard, it’s a standard immigration check to enter the region. In Dakhla, the currency used is Moroccan dirhams. There are several ATMs in town and a few money exchange offices as well. There are also two ATMs at the airport in the arrivals hall. Most restaurants and smaller businesses will not accept credit cards so cash is important to have. Languages spoken in Western Sahara include Hassaniya Arabic, Moroccan Arabic, Spanish and French. In Dakhla itself, there wasn’t much Spanish spoken, mostly Arabic and French. Very little English is spoken but people are friendly and will certainly do their best to communicate. Western Sahara is a disputed territory and as a result, there is always the possibility of conflict and political demonstrations. You should check for the latest information on safety, via local and government websites, to assess any potential danger. With that said, Morocco’s heavy military presence in Dakhla itself does keep things relatively quiet. From what I was told by those I met in the region, Dakhla is quite safe in terms of regular crime. The main thing to watch out for is dehydration and a constant dry and dusty wind during the spring and winter that can really take its toll on you. 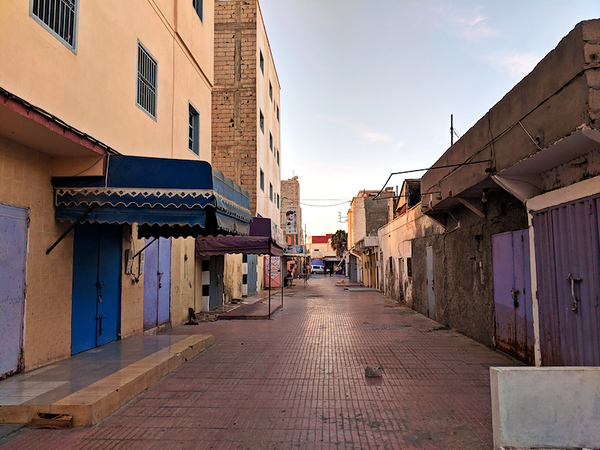 After walking around for 1 week, the only other accommodation that looked decent were the Hotel Albaraka ($100 USD per night) and Hotel Mansour ($80 USD per night), both in the center of town. However, I don’t see any reason to pay those prices when you can get the Dar Rio Oro for less than half. There’s a handful of restaurants in town and you can always head into one of the bakeries for a sandwich, pastry or quiche as well. The main market, while quiet, does have some stalls serving prepared food. I ate most of my meals at the friendly Ikram’s. 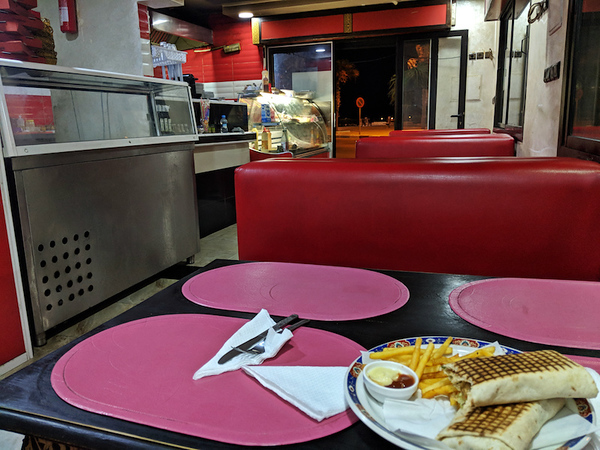 This small restaurant is in the exact center of town at the main traffic light and offers simple, inexpensive and tasty soups, wraps, grilled meats and fish and salads. A hearty meal costs about 50 dirhams ($5 USD). The place only has about 6 tables but seemed to be popular compared to other restaurants. Across the street is the decent Restaurant Bahia, again, with simple offerings that were, in my opinion, not as good as Ikram’s. For proper restaurants, there is the Villa Dakhla, offering typical Moroccan dishes as well as international food at a premium price. The setting is great, right on the water and they do serve alcohol. Casa Luis serves up good Spanish-Moroccan cuisine and Chez N’Tifi, on the edge of the town center, is an excellent option for cheap, local fare. Casa Lola and Samarkand were also both recommended but I never tried them. In the evenings, many tea shops open up in town, although most remain pretty empty. If you find one with patrons, it’s a good chance to enjoy some Moroccan tea while trying to interact with locals who will certainly be curious about you. Dakhla is small! You can walk everywhere and anywhere in this town. You can even walk from the airport to the town center in about 18 minutes. If you want to visit the outskirts, which include the opposite coast, the lighthouse or the nearest beach, you might want to take a taxi. Taxis are shared and you simply wave one down, although you might have to wait a while for one to actually pass. Then, just tell the driver your destination and get in. They’ll get you there eventually, probably picking up and dropping off another person or two along the way. At the end, you hand over 15 dirhams ($1.58 USD) and you’re good. If you’re taking a taxi to the Beach KM 25 or the popular windsurfing area, located about 20-25 minutes north of town, you’ll have to negotiate a price ahead of time. In Dakhla itself, there isn’t much. Lighthouse, market and Oum Lbouer, the closest beach which is about 10 minutes drive out of town. North of Dakhla, about 20 minutes, is Beach 25 (at KM 25 on the main road) on the edge of the Dakhla Lagoon. This spot marks the start of an area that is popular with those interested in windsurfing or kitesurfing. You can actually stay out here at one of the windsurfing camps, such as Ocean Vagabond, which offer bungalows and a restaurant/bar near the water (they range from budget to quite upscale). The main downside is that apart from the beach and windsurfing camps, there is nothing else around. If you’re really into windsurfing or kitesurfing, it’s perfect. If you’re just curious, it’s best to stay in Dakhla and spend an afternoon out here. The desert and mainland coast! 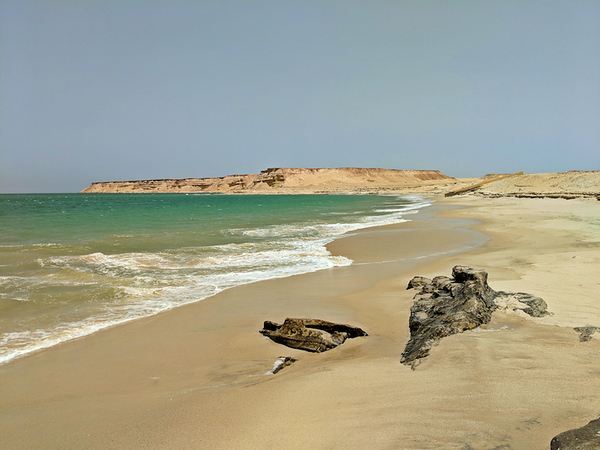 If you gain anything from this guide to Dakhla, it should be the need to hire a driver with a 4×4 vehicle and let them take you off the peninsula and show you the surrounding desert and the untouched coast. It’s some of the most inhospitable land on the planet but with that comes some of the most stunning and surreal landscapes I’ve ever seen in my 19 years of travel (it even rivals the unbelievable Socotra Island). We’re talking off-roading in the rough, barren Sahara, gorgeous white sand beaches without a soul around, 100 meter tall sand dunes rising out of the water, massive sweeping plains of soft pink sand and so much more. Want to Know More About My Trip to Dakhla? Check out my post Travel to Dakhla: Straight Into the Unknown for the complete story. 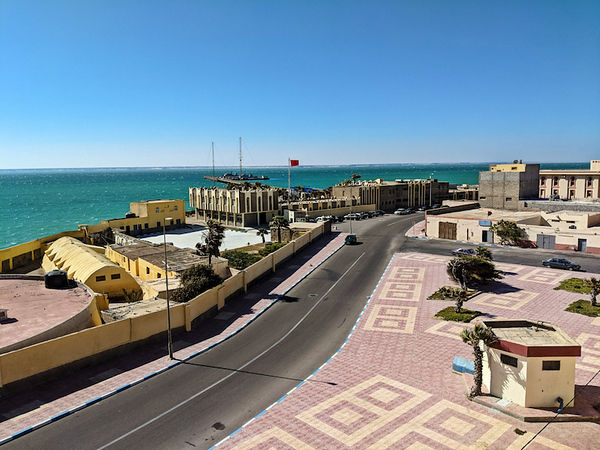 If you have any questions after reading this guide to Dakhla, just let me know! I’m going to Morocco next month and from there I would like to go overland to Western Sahara. Is it really easy to cross the border by land from Morocco? I have a EU passport, do you think that I need a spciel visa from Morocco? And last question, from Dakhla I would like to go south and cross the border to Mauritania. Is it possible? Hey Ravi – Yes, it is quite easy and you will simply go through a normal immigration check. If you are allowed into Morocco, you are generally allowed into Western Sahara. From what I heard, it is possible to cross into Mauritania as well. Just make sure you have the necessary visa if needed. Plenty of people drive or travel along this route between Morocco and Senegal. We go there in the month of February. Can we find a place where you can simply swim? Not in the town itself. But about 5 kilometers outside of town is a beach where you can swim. It will be freezing cold water in February since it’s the Atlantic Ocean but if you’re up for it, you can go in! Thank u for giving this place the much needed exposure it deserves. After constantly being labelled a desert wasteland, you have finally given a voice to this uncharted part of the world. One thought: For places with a primarily (or wholly) Muslim population, it would be helpful to provide some information specifically for women and girls. For example, if we wear regular Western clothes appropriate to a hot climate, will or could we have problems — even if “only” stares or threatening looks; are women welcome — truly welcome — in all eating/drinking establishments; is it safe to take a taxi by ourselves, etc. I’m really hoping to do your Morocco tour this year, but I might be in Russia at that time. However that works out, thanks for being low-key and real in all that you publicly do. Hey Jane – Thanks for the thought, that does make sense. 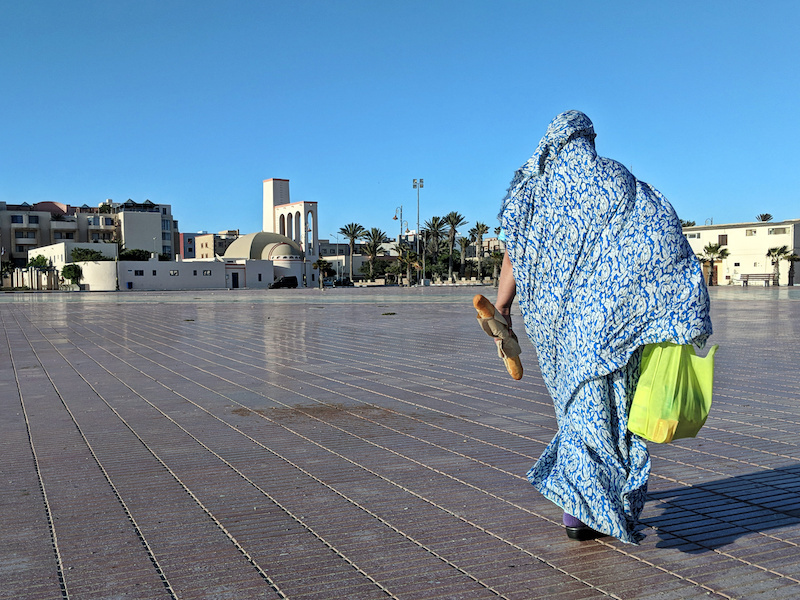 As for Western Sahara, like most Muslim countries, it would be best to dress conservatively. Hot weather western clothing would generally not be appropriate and you would want to wear pants and shirts with at least short-sleeves. You would be allowed in all eating establishments (there’s not many drinking ones but a few restaurants serve alcohol and you would definitely be allowed). It’s safe to take taxis and to travel around on your own. The main thing would be the clothing and keeping it conservative would make your trip easier. And I look forward to hopefully traveling with you to Morocco! The next trip will be in April if you can make that one! Nice read. Very informational. Keep exploring and sharing.